Director/Story – Gary Sherman, Screenplay – Ceri Jones, Producer – Paul Maslansky, Photography – Alex Thomson, Music – Wil Mallone & Jeremy Rose, Makeup – Harry Frampton, Art Direction – Denis Gordon-Orr. Production Company – KL Productions. Two students find the body of prominent Ministry of Defence official James Manford lying in London’s Russell Square tube station platform. However, by the time they return with a constable, the body is gone. Manford’s disappearance piques the interest of Inspector Calhoun of Scotland Yard who mounts a determined investigation, despite being blocked by officials. 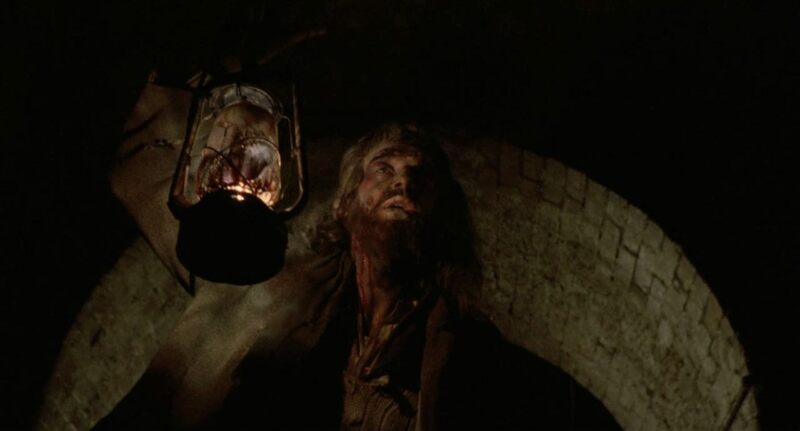 Eventually, Calhoun’s investigation uncovers a secret enclave of survivors beneath the tunnels – the descendants of workers who were buried by a railway tunnel cave-in in 1895 and were subsequently abandoned but have instead survived and bred, all the time living on the flesh of their own dead. Now, with the death of his wife, the last survivor has emerged into the present-day world in search of new victims. Death Line is a film has garnered a minor cult reputation. It was interestingly a largely American-made attempt to tap into the then all-pervasive Anglo-horror cycle of the 1960s/70s that had been created by the enormous success of England’s Hammer Films. (This is something it does well, capturing an uncannily realistic grasp of regional English colloquialism and place). The film employs two of the mainstays of the Anglo-horror cycle – Christopher Lee and Donald Pleasence. and Donald Pleasence. Donald Pleasence has quite the time of his life in what may well be the best performance he ever gave as the working class inspector, constantly making peppery, sardonic asides and betraying a predatory intelligence beneath the sarcastic aloofness. Christopher Lee you get the impression is there as a marquee name and makes a minor appearance of one scene as a mysterious government official. Perhaps Death Line is ultimately a little too slow to go beyond being an item of minor interest, but the script is good and the principal nemesis intriguingly original. The scenes with the near-mute Hugh Wilson wandering through the ruined tunnels and tending the captured prisoners and his wife’s body effectively alternate between goriness and pathos. Director Gary Sherman has maintained a minor genre presence since with efforts such as the zombie film Dead & Buried (1981), Poltergeist III (1988), the psycho-thriller Lisa (1990), the medium thriller Murderous Vision (tv movie, 1991) and 39: A Film by Carroll McKane (2006), although all of these others have been routine. He has also acted as a producer on the tv series Poltergeist: The Legacy (1996-9) and the tv movie The Glow (2002) and wrote the story for the psychotherapy psycho-thriller Phobia (1980).